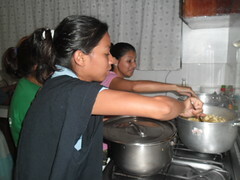 On Sunday, November 30th, the Servant Sisters of Chone had a gathering for girls with the motto "Thanksgiving". Recently we had the great idea of starting international get-togethers focusing on a different country each time. Since we were so close to Thanksgiving, the first country that was chosen was the United States. Although the get-together was on Sunday, the girls who could make it on Saturday came in the afternoon to get a head start with some things in the kitchen, because the gathering included food, typical dance, history of the country and games. Then, we divided into teams, each with its own mission. Some were in charge of preparing the "turkey" (which was really a chicken), others were making the potatoes, others peeling apples for the dessert, etc. We were going to do a full-fledged Thanksgiving dinner. As soon as the meal was prepared, we explained in what exactly consisted the celebration of Thanksgiving for the people of the United States. We saw several videos that told the history of Thanksgiving and others with the typical Indian and English dances. Then we gave them newspapers, cardboard and paint. 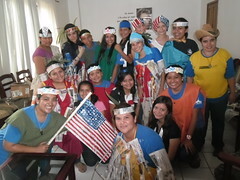 They had an hour and a half to make costumes and to organize the festival that we would have before the big meal. An award was given for creativity because the costumes were brilliant. All the girls who were in the get-together took part in the festival, even the shy ones. There were two girls who were the hosts of the festival and the others were either “pilgrims “or “Indians “, and they imitated the traditional dances. There was an atmosphere of festivity and joy, we laughed a lot and, towards the end, some of the girls were almost feeling dizzy from the appetite that they had worked up. The moment that we had all been waiting for had finally arrived: mealtime. It was almost four o'clock in the afternoon by the time we started eating, but it was definitely worth the wait because everything was delicious. After lunch we went outside to have a meeting on the Gospel of the ten lepers, commenting on the importance of being grateful. To put it into practice, each one shared something for which they were grateful. 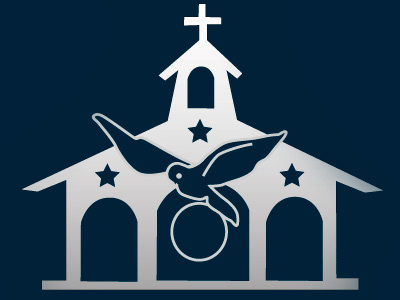 Some were grateful for their families, others for their mother, others were grateful for the Home of the Mother, for the mission trip to El Puyo, for the grace of being able to respond to their vocation, etc. It was really an elevating meeting where we all experienced the closeness of Our Lady and the desire to continue on the path of holiness with renewed strength. Someone said, “Wow! We have received so much…! We are so foolish, because we forget so many times to be grateful! That was how our first international get-together went. May our lives be a continuous "Thanksgiving". Not for the food, but because we always have reasons to be thankful. God works all things for our good and for this, and for so many other things, we should constantly be thankful.